Einstein arrived in the United States in 1933, the year the Nazis rose to power in Germany. From that moment until he died in 1955, J. Edgar Hoover's FBI—with other agencies—feverishly collected "derogatory information" to undermine the renowned scientist's influence and destroy his reputation. With material accessed under the Freedom of Information Act, Fred Jerome reveals the depth of, and the reasons for, this massive anti-Einstein campaign. He also uncovers Einstein's strong political commitments that have been conveniently buried under the image of the absent-minded icon genius. Whereas Einstein said on several occasions, "My life is divided between equations and politics," Jerome delves into his little-known political half-life. Einstein, Hoover… Trump Jerome's preface to this new enriched edition of The Einstein File, traces the path of surveillance from J. Edgar Hoover, through McCarthyism, to the Trump era. The preface also presents new information gathered about the things that the FBI hated so much about Einstein: his very close friendship with Paul Robeson and their collaboration in fighting racism; and his studied position on Israel and Zionism that Israeli polticians do everything to hide. Review by Choice Review "Using the more than 1,800 pages in the file that the FBI maintained on Albert Einstein, Jerome (Syracuse Univ.) has crafted a cautionary tale of government excesses during the Cold War era. Einstein became the target of J. Edgar Hoover's FBI because of his pacifism and his connection with "Red front" organizations. The FBI monitored the scientist's phone calls, opened his mail, and rooted through his garbage in an attempt to uncover evidence that Einstein was an active communist agent. Their efforts were in vain. Some of the material in the FBI's file can only be labeled as ludicrous, although it had serious consequences. In addition to exposing the lengths to which the FBI was prepared to go during the height of the Cold War, Jerome also examines Einstein's political activism, refuting the portrait of the benign, absent-minded professor that has emerged in the years since the scientist's death. Although the author is inclined to see things in terms of black and white, with Einstein elevated to heroic status, his book nonetheless provides a vivid portrait of the McCarthy-Hoover years, as well as a reminder of the continuing problems confronting civil liberties in a national security state. All levels." W. M. Leary University of Georgia Library Journal Review "It is not surprising that J. Edgar Hoover's FBI spied on Albert Einstein from 1933 to his death in 1955. As this well-done study makes clear, the famous scientist was also a social and political activist with strong pacifist and Socialist leanings. Einstein publicly supported the civil rights and anti-lynching movements and was a friend of leading African Americans. Unafraid, he was willing to denounce Joseph McCarthy and encouraged others to refuse to testify before him. These activities, plus his role in the development of nuclear weapons, led Hoover to investigate Einstein in search of "derogatory information," hoping to discredit and eventually deport him. While Hoover wanted to discover that Einstein was a Communist, his agents also collected crazy stories such as that one of Einstein's children was held hostage by the Soviets. 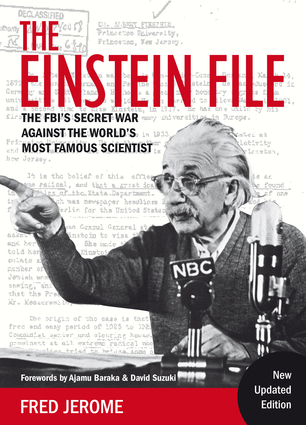 Journalist Jerome uses Einstein's 2000-page FBI file plus interviews with people familiar with the case to tell this story. Perhaps the most useful aspect of this excellent book is that it reminds readers of the less-celebrated aspect of Einstein's character: he was ready and willing to participate in the political arena." Harper's Magazine "A highly readable book -- investigative journalism that qualifies as academic history. It is also scary." Fred Jerome is an experienced journalist and science writer. His work has appeared in dozens of publications, including Newsweek and The New York Times. He taught journalism at Columbia Journalism School, NYU and other universities. A recognized specialist on Einstein, Jerome is also author of Einstein on Israel and Zionism and co-author of Einstein on Race and Racism. Ajamu Baraka has been involved in grassroots organizing, international solidarity, and educating for over four decades. He was the founding Executive Director of the US Human Rights Network from 2004 to 2011. He was the Green Party's nominee for Vice President of the United States in the 2016 election. Ajamu Baraka holds a PhD in political science and has taught political science at various universities. He lives in Atlanta, Georgia. David Suzuki is a geneticist, broadcaster, and environmental activist. A Canadian of Japanese origin, he and his family were interned during World War II. He holds a doctorate in zoology from the University of Chicago. His work as a broadcaster, particularly with CBC's The Nature of Things made him a unique figure in science and television. He is the author of 52 books, 19 of which are for children. David Suzuki lives in Vancouver, B.C.